Rent Tavern At The Park | Corporate Events | Wedding Locations, Event Spaces and Party Venues. Tavern at the Park is directly across Millennium Park, offering an amazing view of the downtown Chicago paired with great food and drinks. 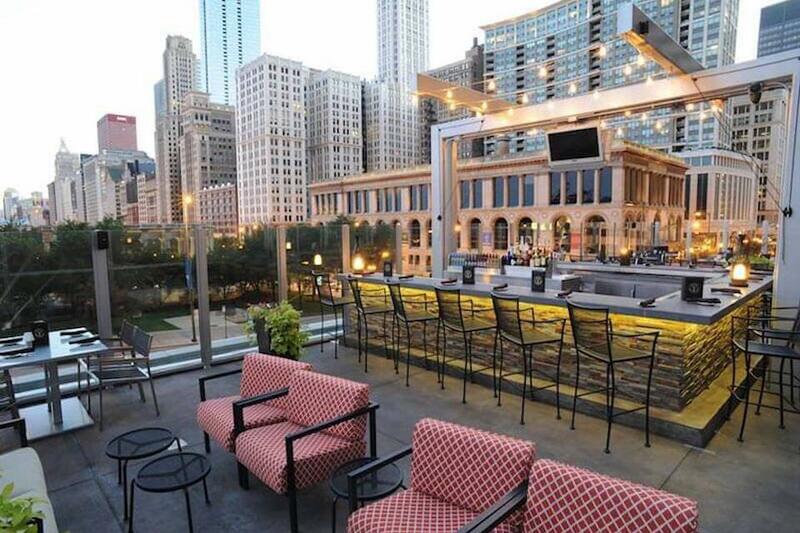 The metropolitan cityscape of the Chicago Cultural Mile, Millennium Park and the unbeatable skyline views make the Tavern Tree House the ultimate rooftop experience. The versatile Tavern Tree House can be configured with casual lounge seating and cocktail tables that compliment a cocktail reception of 20-200 guests. The Tavern Tree House is comprised of two areas: our glass-enclosed atrium with retractable floor to ceiling windows and al fresco patio seating featuring our 20-seat bar. Host your next social event or corporate dinner in the weather-friendly Atrium for up to 50 guests for a seated dinner, or up to 100 guests for standing cocktail receptions! Complimentary audiovisual equipment and support is available for your event. The breathtaking views of Michigan Avenue and Millennium Park make the Skybox the perfect space for your special gathering! The south and west facing windows provide natural light and beautiful panoramic city scenery for your guests while they enjoy a seated dinner (accommodations up to 21- 25 guests) or standing cocktail reception (accommodations up to 30 guests). Complimentary audiovisual equipment and support is available for your event. The Exposition Room is our most secluded room, perfect for working lunches or dinners! The room was designed to create an intimate setting for you and your guests where you determine the level of privacy that your event requires. The exposition room is ideal for your next presentation as audiovisual equipment and support is complimentary in this room. Accommodations for a seated dinner up to 34 guests, standing receptions of 30-35 guests. A perfect room for intimate celebrations and business meetings! The Pub Room is located on the first level of our venue and can accommodate seated events of up to 10 guests. This completely private space offers complimentary audiovisual equipment and support for your event. The semi-private Second Floor Dining Room is a lofted area featuring splendid views of Randolph Street and Millennium Park! This open area overlooks our lively first floor bar and is an excellent choice for corporate events, rehearsal dinners or your next cocktail reception. Accommodations of 65 guests for a seated dinner or 95 guests for a standing reception. *The 2nd floor dining room, sky box and exposition room can be combined for events which accommodate up to 100 guests for seated dinners or 150 guests for standing receptions.